WordPress and GeoDirectory both are configured with English by default, but can easily be translated into other languages. In this document we will introduce the how translated strings are stored, edited, and loaded to a site to display a new translation. The goal of this guide is not just to help you become familiar with translation. Once the new translations are setup in the GD site, you can edit and update your translation files any time. Once you start translating, and even changing the default text, you will probably find many ways to make the text ‘speak’ to your community of users. .po and .mo files are the standard method for storing “translated strings”. .po files are for doing translations. .mo files are for showing translations on your site. .po files can be edited with PoEdit, the free cross-platform desktop translation app. When you edit a .po file in PoEdit, and then save the file, PoEdit will also create/update a matching .mo file. Store BOTH the .po and the .mo files in the the proper site folder. GeoDirectory Core Translations are maintained at https://translate.wordpress.org/projects/wp-plugins/geodirectory, so go there if you want to download existing translations of GD Core. GeoDirectory Addon Translations are maintained at https://wpgeodirectory.com/translate/projects, so go there if you want to download existing translations of GD Addons. GeoDirectory Core plugin translations are maintained at https://translate.wordpress.org/projects/wp-plugins/geodirectory. 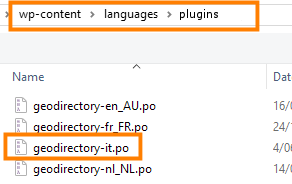 If you are looking for existing translations of the GeoDirectory Core plugin in additional languages, you can go there to see which languages are available. If your language is not currently available or at less than “100%” then consider joining the GeoDirectory translation team where members work together to make excellent, accurate translations available in every language. Visit the Translators Handbook to find out more. Once you have completed your translation of GeoDirectory core plugin into a new language, the .po and .mo files must be transferred to your GD Site, usually by FTP. On your GD Site, the translation files for GeoDirectory core are stored in “wp-content/languages/plugins/”. Use the following table to “check your work”. The most common reasons that a translation file won’t load is because it is named incorrectly or because it is stored in an improper folder. GeoDirectory Addon translations are maintained https://wpgeodirectory.com/translate/projects. If you are looking for existing translations of addons you should go there to see if your desired language is available. Translated files for GeoDirectory Addons are stored in “wp-content/languages/plugins/”. Use the following table to “check your work”. The most common reasons that a translation file won’t load is because it is incorrectly named or because it is stored in an improper folder. Only the default English translation is available for AyeCode’s GeoDirectory themes. You can find the default file inside the languages folder of the theme. Translated files for GeoDirectory themes are stored in “wp-content/languages/themes/”. Use the following table to “check your work”. The most common reasons that a translation file won’t load is because it is incorrectly named or because it is stored in an improper folder. Here we provide an example of how to download an existing translation. In the example below, we will download an Italian translation of GeoDirectory Core, and then add the translation file to the GD site. Review the translations on your site. If you find untranslated strings, continue to the next section for information about how to edit the translation files. Download an existing translation or create a new file. In either case, save the translation .po file to the desktop. Open the file with PoEdit and select the new language. Save the file with PoEdit on to the desktop with the new locale. Find the .po and .mo files on the desktop. Transfer the .mo and .po files via FTP to the proper site folder. Login to the site with FTP and navigate to the appropriate languages folder. Download the appropriate .po file from the site folder, and save a backup copy in another location. Open with PoEdit, Translate with PoEdit, Save with PoEdit. Identify the new .po and .mo files in your local save location. This example is for translation of the core plugin. The process is the same for any plugin or theme, with the notable exception that the files are stored in the site in different folders. Download POedit and install the free program. Download the default translation. Each plugin or theme comes with English language .po and .mo files. Use FTP or cPanel to download the default language .po file to your local machine. You only need the .po file. PoEdit will create a new .mo file upon save. Make sure the filename matches the default translation filename. 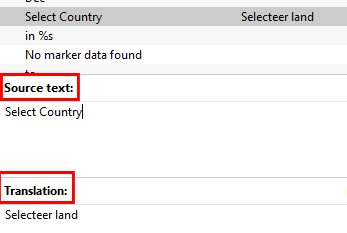 Example: geodirectory-nl_BE.po. transfer BOTH the .po and the .mo files via FTP to the proper folder on the site. Save a backup of the files on your desktop and in your personal cloud, just in case of emergency.